Jesus called his twelve followers together. Jesus gave them power over evil spirits. Jesus gave them power to heal every kind of disease and sickness. These are the names of the twelve apostles : Simon (also called Peter) and his brother Andrew; James, son of Zebedee, and his brother John; Philip and Bartholomew; Thomas and Matthew, the tax collector; James, son of Alphaeus, and Thaddaeus; Simon the Zealot and Judas Iscariot. Judas is the one that gave Jesus to his enemies. What an interesting, amazing, and strange group to choose if your goal is to forever change the world! But there they are. 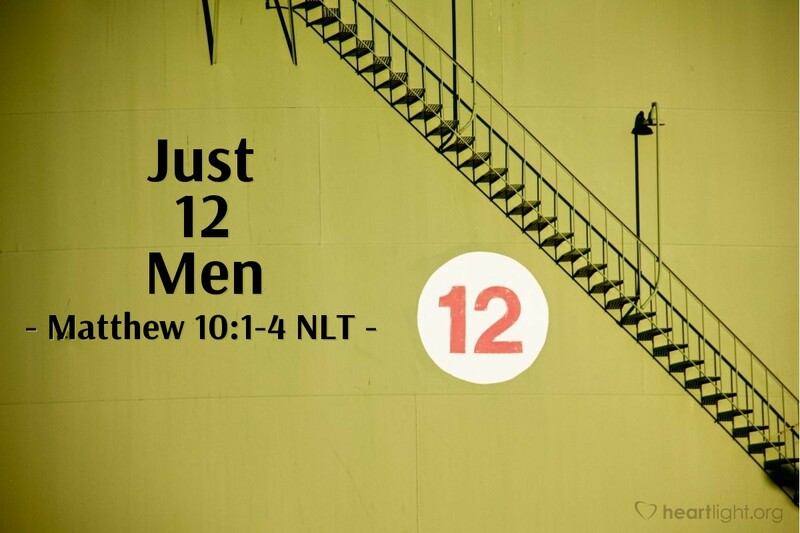 A dozen men who, because of Jesus' life and resurrection and the power of the Spirit, forever changed the history of our planet. We have such a great temptation to revere these men because of the good they did. While we must be appreciative of those who were faithful and paid the ultimate price for their discipleship, we must also realize that the glory of their service is found in their Master, not in that they were the Master's servants. What makes them special is that Jesus called them and gave them authority to do great works to bless others. I wonder what he wants to do with us? I wonder what role he wants us to play in his great work of redemption? O gracious God and Father, give me the heart to follow Jesus, the faith to expect his great works to be done through me, and the humility to give him all the glory for what happens that is good. In Jesus' name I pray. Amen.